Chicago based artist Daniel G. Baird titled When. with an opening reception on Saturday May 14th from 4 – 7PM. The understanding of our place within the vast and complex lineage of time is dependent on our acceptance of both the grounding importance of the moment as well as the surrender to that moment becoming a mere memory just as fast as it is experienced. Our place within time runs parallel to a myriad of simultaneous histories, from the stories of all of man, to the technologies and advancements that function as markers of progress. Daniel G. Baird’s practice is a layered archeological exploration of these markers, the symbols that function as records for our enigmatic relationship with time and progression. When is an observational tour of various forms of time records, from the ubiquitous and infinite symbolism of a horizon to the erosion made markings on the walls of cave systems and fossils. 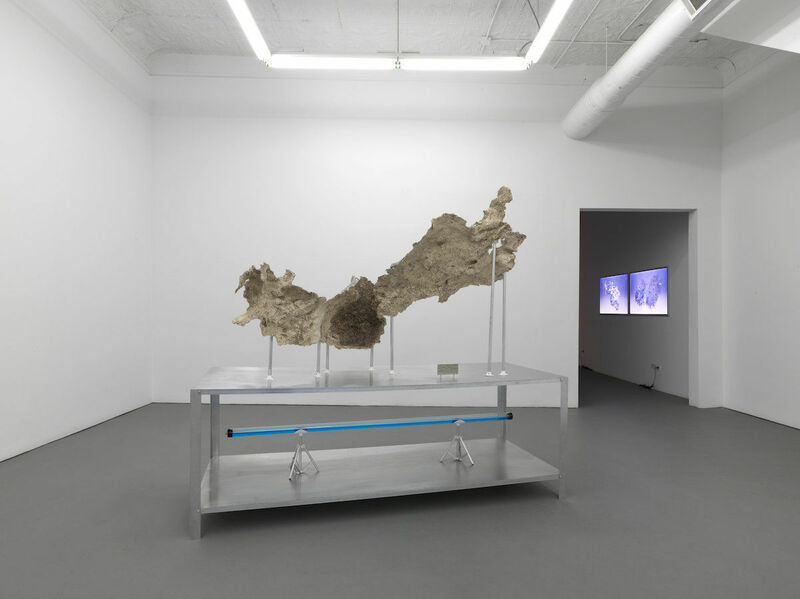 These records are presented through displays that borrow language from institutional and archeological preservation of artifacts as well as contemporary vehicles of information; television, monitors, tablets, and smart phones. These languages mark different systems, which point to particular times in history, but share a similar resolution, to communicate story. Our gaze into the surface of a tablet’s screen shares a lineage of representation with the flickering lights illuminating cave drawings at the dawn of man. 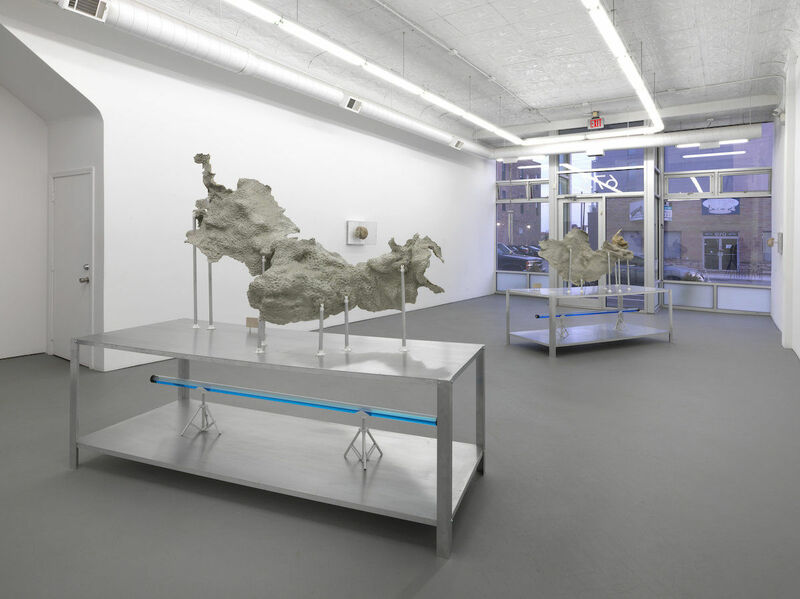 Baird’s approach involves unearthing and sourcing of material on-site. Traveling to various cave systems in the US, Baird creates a mold of the surfaces of various cave walls, casting sculptural elements which capture the textures and histories of these natural formations. 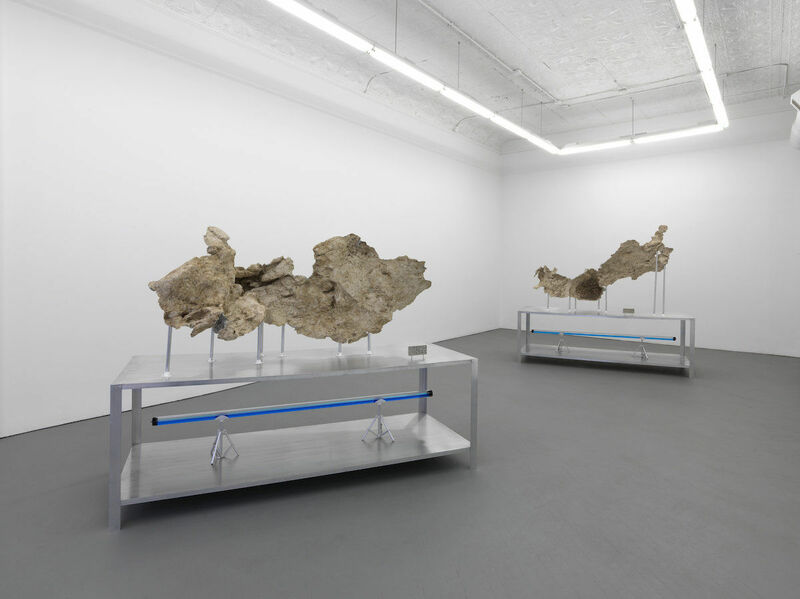 The casts are executed and displayed as fragments, showcasing select components of that site’s particular story. 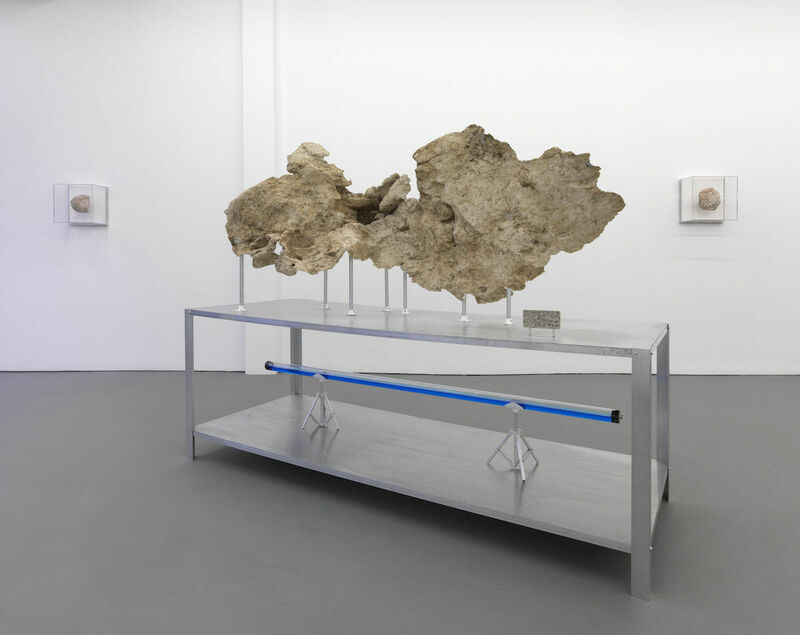 In joint dialogue, Baird’s Moment’s are a collection of fossilized tortoise shells. Suspended in acrylic vitrine displays, these specimens capture different moments in time through a similar vehicle. The horizon is a constant element explored through out, from the thin reveal in the acrylic housing the tortoise fossils to the cast painting the Distance (7). 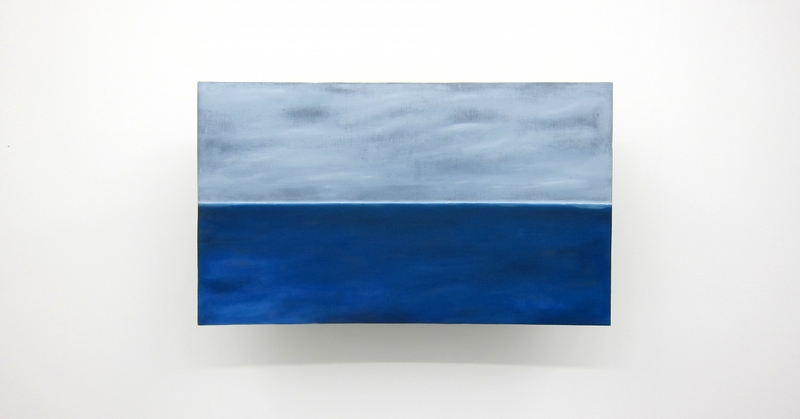 Executed in line with the proportions of a television flat screen monitor, the Distance (7) gestures at the sublime image of an ambiguous horizon in the distance of the ocean. Perhaps most accordingly, the present itself is explored via the invisible. 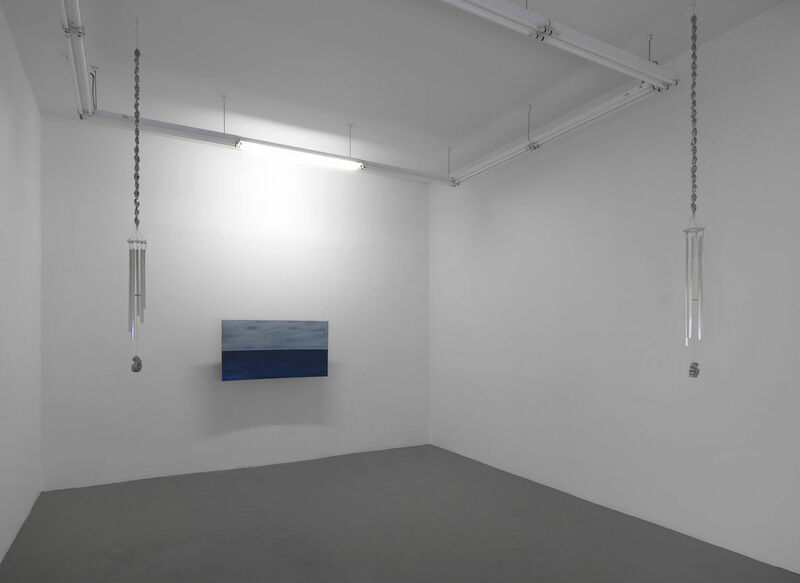 With a series of wind chimes dispersed throughout the space, the present announces itself in their activation, transforming the engagement of the object to that of an auratic tone. DANIEL G. BAIRD (American, b. 1984 Edison, NJ.) is an interdisciplinary artist living and working in Chicago, IL. He received his B.F.A. from the School of the Art Institute of Chicago in 2007 and his M.F.A. from University of Illinois in Chicago in 2011. 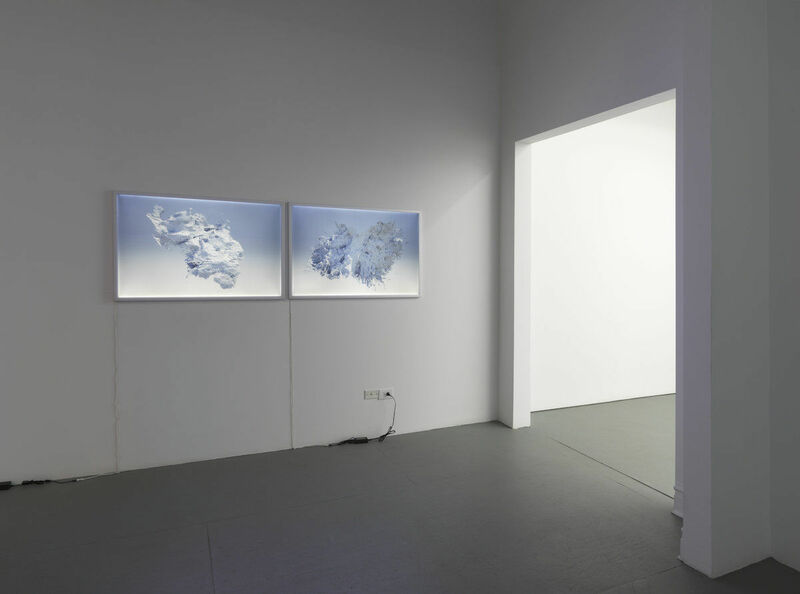 Select recent solo and group exhibitions include Has the World Already Been Made X7 with Haseeb Ahmed at Harlan Levey Projects in Brussels, Belgium; Vestige, The Institute of Jamais-vu, London, UK; There is a Screen, LVL3, Chicago, IL; COSMOSIS curated by Steven Bridges, Hyde Park Art Center, Chicago, IL; Lynchedpinned and Bitten, In the Pines, Jackson, WY; Real Things About Real Things at American Medium in New York, NY; A Posture and Latency, Leeds College of Art Galleries, Leeds, UK; The Weight of Water Depends on its Temperature, ParisTexas, Antwerp, BE; and Condensed Matter at the Synchrotron Radiation Center in Stoughton, WI.